With another Brad Pitt-starring blockbuster getting released this weekend (Andrew Dominik’s Killing Them Softly), I decided to do a tour back through the career of the 3-time Oscar-nominated actor. He has developed a very diverse filmography, particularly lately when he has seemingly worked with a new major director each and every outing. He started out as essentially a pretty boy, but he seamlessly disappeared into a few roles early on and eventually became one of the most bankable and reliable actors in the business. 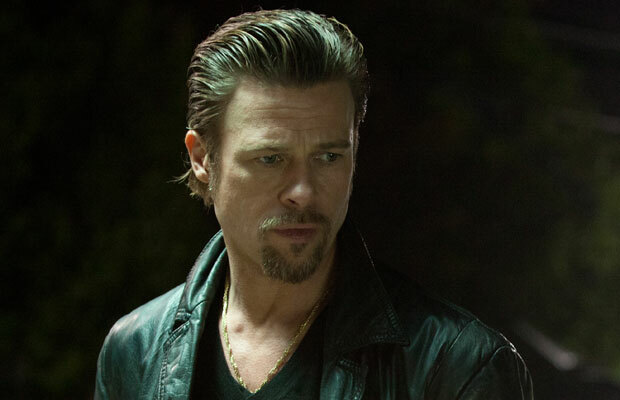 Here’s to his work in Killing Them Softly being worthy of adding to this list! This may very well be Pitt’s funniest performance. He is a menacing character, but his lines are hilariously delivered over-the-top and his attempt at Italian is just amazing. He had just as much to do with the success of the film as Christoph Waltz did. 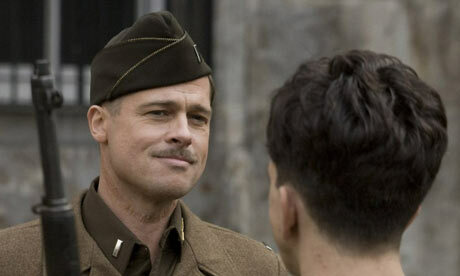 His monologue to his Nazi-scalping Basterds is one of the best of the decade. He doesn’t really disappear into the character, but that is part of its charm. He is one of the many things about the movie that leave a lasting impression. Even though the film may be a bit soapy and melodramatic, Pitt’s lead performance is really what thrust him into movie-stardom. He lingers around the movie in a very James Dean in East of Eden-kind of way. He is emotional and heroic. The movie hinges on his character and on Pitt’s ability to make the audience care about him. This Golden Globe-nominated performance was the one that let everyone know that he had arrived and that he was not going anywhere for a long time. This is another case of a mediocre film that is carried by Pitt’s performance and charisma. Here, we see Pitt completely unhinged, shedding any pretty boy Robert Redford-type image that may have been put on him to that point. However, he also makes the trailer-trash serial killer into someone curiously likable. Only he could have turned this typical psychodrama into something really interesting and authentic. He doesn’t often play the villain, but here he absolutely kills it. Pitt’s performance in Babel is absolutely devastating. To this point, I hadn’t really thought that he had something like this in him, or at least he hadn’t really made an attempt to take on a character that would really push the boundaries of what he could do emotionally. 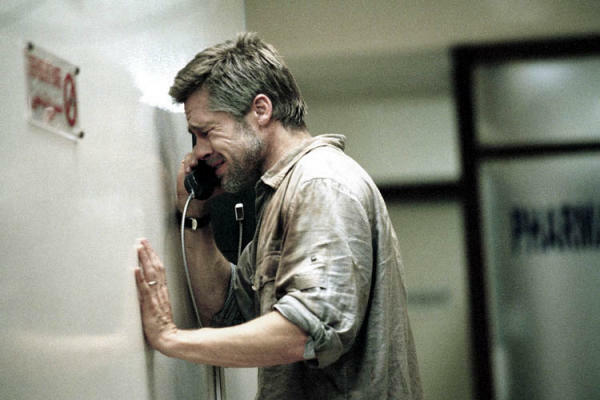 The phone call scenes are deeply affecting, focusing on his frightened and heartbroken face, one of the only times during his career where Pitt truly bared his soul and made us really feel something. In one of Pitt’s most impressive feats, he took a normal guy in a seemingly mundane situation and turned it into a heroic American story about something much deeper. Pitt nails every line he is given and plays off his costars (most notably the equally-brilliant Jonah Hill) and makes us actually care about the Oakland A’s. So often, subtlety is overlooked when talking about elite performances, but Pitt’s work here was actually singled-out and should have brought him Oscar gold. His scenes where he is wheeling and dealing with other GM, as well as the scenes carried by his facial expressions (sitting alone in an empty stadium listening to the game in short segments on the radio), show that this is one of Pitt’s most complete performances and one that may be looked back on as a defining role in his soon-to-be legendary career. This is one of those roles that may have seemed like an easy role on paper, but when it is given to a certain actor, it becomes a role for the ages. Pitt’s smile and appeal make his performance one that burns in the memory of the viewer. Those scenes such as “I’ll never leave Montana…” just break your heart and help make the film one of the most emotional of that era. This is perhaps a personal and nostalgic choice to be on this list, but I have always been blown away by Pitt’s work here, the best performance in a rather strong ensemble. In a role that could arguably be ranked #1 on a list of most iconic movie characters of the last 20 years, Brad Pitt creates his most memorable role ever. Pitt’s furious energy and maniacal character are really what makes Fight Club what it is, a generation-defining cult classic. His chemistry with Edward Norton is incredible. In this role, he is mysterious, hilarious, unlikable, irresistible, enthusiastic, and pissed off, all the while having this unbridled physical energy about him that brings him to life. It is one of the most unforgettable characters in recent film history, and I honestly cannot imagine another actor playing the part nearly as effectively. In what will go down as Pitt’s most underappreciated role, his Oscar-nominated turn in Twelve Monkeys is one of the most impressive performances he has ever given. Here, he plays an insane person with an unrestrained psychotic energy about him. This is one of his biggest steps out of the box, and while it may seem like he takes it too far, he somehow avoids caricature. 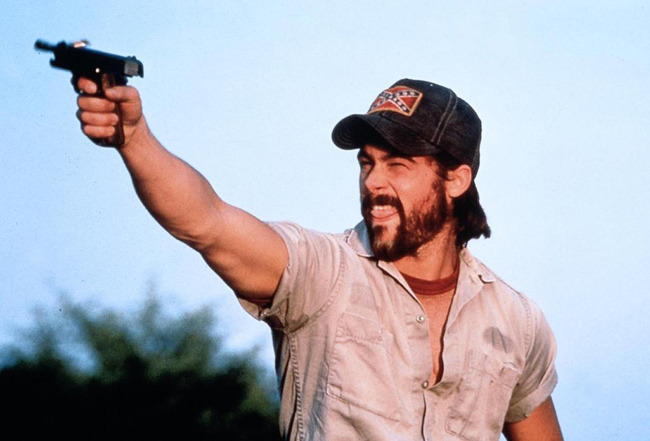 Of all the over-the-top psych-ward inhabitants we have seen on screen, Pitt’s Jeffrey Goines may be one of the most believable and devious. It is a volatile performance that really shows off what Pitt can do when he gets a great role. Pitt’s performance in Terrence Malick’s ambitious epic is unquestionably his most mature performance to date. He plays a rough, unlikable, hard-working, disciplinarian father/husband. He completely disappears into the role. In almost every one of his serious turns there is still are still relatable and affable traits about the character. In The Tree of Life, however, there is none of that. His performance is first and foremost physical, with tight, troubled expressions. He has a few outbursts, but most of the pain of the character is internal and shown on his face. For a role originally intended for Heath Ledger, would say that Pitt filled those shoes admirably. It would have probably been a slightly different dynamic with Ledger in this spot, but I am not sure it could have been any better than what Pitt accomplished. I know that this cannot be everyone’s choice for the top spot, but I do not think I have ever been more haunted by a character that Pitt has played than I was when I first saw Jesse James. Even though Casey Affleck was nominated and decidedly better in the film (a top 5 performance of the 2000s), it is Pitt’s weary and sensitive performance that lingers in the memory of the film. He is incredibly restrained and subtle. His character is at times depressed, and just by looking at how Pitt carries himself you can see a wounded spirit. His performance is cool and calculated with a twinge of menace and edginess. It is the most complete performance that Pitt has ever given and one that will stick with me forever. It may not be his showiest role or most iconic character or biggest step outside his comfort zone, but for me, this is his best work to date. So, there you have it. Agree/Disagree? I know Jesse James cannot a popular choice for #1, but does anyone else have it ranked highly? What are your favorites? Let me know in the comments or on our Facebook page. 25. (23) Oklahoma State (7-4) – That was a tough loss for the Cowboys against their archrival Oklahoma. They showed that their offense is almost as potent as it was last year. 24. (18) Rutgers (9-2) – They blew their chance at clinching with an embarrassing loss against Pitt. Well done. 23. (14) Louisville (9-2) – They blew their chance at getting a play-in game against Rutgers by losing to a 4 win UConn team. Well done. 21. (19) Michigan (8-4) – I get it. Just because you lose to 3 top 5 teams doesn’t make you a great team. But that schedule in retrospect was insane. They are a tough team. 20. (NR) San Jose State (10-2) – Having Saturday night on ESPN all to themselves, they took care of LT and that vaunted offense. If not for a 20-17 loss to start the year to Stanford, this could be another one-loss team looking for an at-large bid by getting into the top 16. 19. (21) Utah State (10-2) – Going unbeaten in the WAC is not too tough of a task normally, but there are some quality teams this year. They are clearly an underappreciated team. 17. (NR) Kent State (11-1) – They completed their near-perfect season with a nice big win over previously-ranked Ohio. They are a solid and quite underrated squad. 16. (15) Northern Illinois (11-1) – The matchup against Kent State could strangely be a play-in game for the BCS, seeing how the Big East is choking all over themselves. 15. (22) South Carolina (10-2) – Playing without Shaw and still moving the ball the way they did was quite impressive, the most impressive they have been since the strange beating they put on Georgia. 14. (10) Oregon State (9-3) – The Beavers showed some fight against the Ducks, but it was just bad timing seeing that team coming off a loss. Now they have an awkward rescheduled game next week against Nicholls State. Nice. 13. (8) Clemson (10-2) – That loss to their in-state rival exposed their offensive weaknesses a bit, but they still have a strong case for an at-large bid. 12. (16) Nebraska (10-2) – The win over Iowa may have been low scoring, but that is promising for that skeptical defense. They should take care of Wisconsin in a rematch of that big comeback by the Huskers, but you never know in the Big Ten. 11. (17) Florida (11-1) – They finally looked capable on offense, thanks to a couple big plays off turnovers. This team is guaranteed to see the Sugar Bowl. 10. (13) LSU (10-2) – A nice win over the upset-minded Razorbacks capped a slightly disappointing season for the Tigers. Hello Cotton Bowl. 9. (5) Florida State (10-2) – If not for an ugly first half and 5 turnovers, this team would have rolled over the pathetic Gator offense. They are still a better team. 8. (11) Georgia (11-1) – That thrashing of Georgia Tech was impressive no matter how bad the GT defense may be. Playing against that offense is always a bit quirky, but they did not even seemed phased by it. This could be our national champion if they can take down the Tide. 7. (9) Texas A&M (10-2) – They ran up the score against Missouri, not that that is any difficult task. If not for a bad second quarter against LSU, the Aggies would likely be playing the SEC title and BCS Championship berth next weekend. 6. (6) Kansas State (10-1) – The week off caused everyone to forget about the Wildcats. Not having that championship game is going to cost them, no matter how dominant they were for the first 10 games of the season. 5. (7) Oregon (11-1) – They let the Beavers hang around in the Civil War before putting on that knockout punch that they have perfected in the second half. A BCS game is assured, just not the one they were hoping for. 4. (4) Stanford (10-2) – That beatdown of UCLA proved that the Cardinal are a top 4 team again this year. I thought that they would win, but they hammered the Bruins. I cannot see it being too different during the rematch. 3. (3) Alabama (11-1) – That was the worst Iron Bowl in…forever. Seriously. I don’t want to ever hear about the SEC top-to-bottom. Wow, Auburn. Wow. 2. (2) Ohio State (12-0) – Notre Dame-Ohio State would have been a cool championship game. Next time, Buckeye boosters, just give them free tattoos…see if that does you any better. 1. (1) Notre Dame (12-0) – They took care of business against the Trojans, earning the right to be number one, no matter how ugly some of those wins were. 5. Kenjon Barner, RB, Oregon – After his horrible game against Stanford, Barner rebounded with another monster game. He will get the fifth nod to New York. 4. Colin Klein, QB, Kansas State – Unless he absolutely blows up Texas, he will be getting the short end of the stick. This is going to be a tough Toby Gerhart-ish loss for Optimus Klein if he doesn’t get the trophy. 3. Braxton Miller, QB, Ohio State – He struggled against the nation’s top pass defense, but he led an undefeated team who would be nothing without him. 2. Manti T’eo, LB, Notre Dame – He had another pick in his season finale and as much TV time as Jerry Jones got on Thanksgiving. He could finally be a full-time defensive winner. 1. Johnny Manziel, QB, Texas A&M – He has as much endorsement from ESPN as RG3 did last year. He is going to win the thing probably, if for nothing else than statistics and one nice upset win. Just when we all thought the landscape of college football was starting to settle a little, Maryland and Rutgers decide to make everything chaotic again. This week, Maryland and Rutgers announced they will be moving to the Big Ten which has started everyone thinking about the next dominoes that will fall in reaction to this latest move. Who will be next to move in the realignment process? The more teams move conferences, the more it is looking like only a matter of time until we have the much discussed "Super-Conferences" in college sports. I am completely fascinated right now by college football and all the many possibilities of how they could operate (see my Holiday Madness brackets as an example). This idea of Super-Conferences is the latest thing to catch my attention. What would it look like? Here is one scenario of how it could all play out. The idea of Super-Conferences is that all major college football programs would fall into four 16-team Super-Conferences. These Super-Conferences would then be split up into two 8-team divisions each. A conference championship game would be played in each Super-Conference that would act as a play-in game into a 4 team National Championship playoff. This could be expanded to 8 teams also with some stipulations put in place on potential "wild card" teams. With that said, how will all the schools be divided? The first thing you realize is that if there are 4 Super-Conferences, then two of the major BCS conferences have to discontinue their football programs. The obvious first choice to fall apart is the Big East. Everyone has been jumping from the Big East as fast as they can so they don't get left out when this all is said and done. Rutgers is just the latest to leave. Last year, Syracuse and Pitt announced they would be leaving for the ACC, West Virginia jumped to the Big 12, and TCU left for the Big 12 without even playing a game in the Big East. Now some of the replacements that had been brought in for football (Boise St. and Nevada) are trying to get out of their commitments to the conference because they see how it is dying. Also, every conference that is losing schools look to pull from the Big East first to get the quality while they still can (like the ACC trying to replace Maryland). The second conference to fold is a little more difficult. A couple years ago, it looked like it would definitely be the Big 12. Four schools (Nebraska, Colorado, Texas A&M, and Missouri) bailed as soon as they could. This is mainly because Texas has become the bully of the conference that controls everything. The schools left put up with it because they don't have a second option like the other four did. Also, without Texas the conference is dead. The other conference that is now looking like it could be on the chopping block is the ACC. With Maryland jumping ship (and rumors that Florida St. now wants out too), the ACC appears to be scrambling to survive. With all this in mind, the Big 12 is still more likely to dissolve. There are too many East Coast teams to lose a conference over there, so unless the conferences get geographically messed up the ACC has to stay around. So that leaves these 4 Super-Conferences: Pac-12, Big Ten, SEC, and ACC. Now how would they all split up? This division gets a couple new teams but from the current conference make-up. Utah and Colorado desperately wanted to be in a division with the LA teams, but it simply makes no sense with further conference expansion. This would put the northernmost 8 teams in the North Division while also keeping the rivalries together. If the Big 12 dissolves, this is the best fit for the rest of the Texas schools and the Oklahoma schools. It almost happened a couple years ago, but didn't due to some issues with TV contracts. (Again, Texas was being the bully.) If this becomes as inevitable as it appears to be, Texas will reluctantly jump to the Pac-12 and take the best of the Big 12 with them, which will definitely kill the Big 12. The first realignment in this division is the rumored move of Illinois into the Legends (they really need to rename these divisions). They also needed an 8th school which is filled by Iowa St. This would make the most sense geographically. The Big Ten may try to go for a bigger name like Louisville or Kansas, but the natural rivalry developed in Iowa may be too tough to deny. Also, Kansas won't go anywhere without Kansas St. It might work to take both Kansas schools, but I think the Cyclones make more sense. Here we see the two newest confirmed members of the Big Ten with Maryland and Rutgers along with Cincinnati, one of the Big East schools that will be well sought after and will most likely land here. Out of all the possible candidates, a second Ohio school would make sense. Ohio St. may try to block it to keep its monopoly on Ohio, but if the Bearcats are going to end up somewhere in a Super-Conference, it might as well be the Big Ten. The SEC only needs two more schools since they already have 14. Louisville would be a perfect fit. It would make some great rivalries in-conference rivalries, mainly on the basketball side of things. Eventually, the football program will catch up to the SEC. Since this division already has a foot into Texas, why not put two feet in Texas? Adding TCU would be a perfect fit for the SEC and TCU the way their program has been progressing. This division has the two new schools that will be joining next year (Pitt and Syracuse), as well as one that is rumored to be joining the conference to replace Maryland in UConn. This division is pretty well set. Notre Dame is almost a full member of this conference already. There is no way they could survive the Super-Conference realignment without joining one. They may try to join the Big Ten, but since they are already connected to the ACC they will most likely stay. With the Big 12 dissolving, this is the best spot for West Virginia to land also. Here is the problem. With four 16 team Super-Conferences, there are room for 64 teams in the big conferences. There are 70 teams (including BYU who is now an Independent) that are currently in BCS conferences. That means, under this scenario, these 6 schools will be left out of the mix. There are two solutions to this problem. First, these 6 schools disperse among the remaining 4 conferences (remember, the WAC is dissolving). Here is the likely way that would happen. This would really be disappointing for several of these schools, especially the Kansas schools. The Jayhawks are a perennial basketball powerhouse that would be banished from the best competition, and the Wildcats are nationally relevant in football at least a couple times every decade. The only way this could be made better is if the football goes to an 8-team playoff with the 4 Super-Conference champs making it with 3 "Wild Cards" and the best team from the other four. This could even be determined by their own 4-team playoff if they want. Here is the other scenario. The Big East doesn't dissolve. Remember, the Big East almost doubles in size when basketball season comes around. Even if this happens and the Big East isn't one of the Super-Conferences, chances are the Big East still survives as a basketball only conference. So here is the option: the six teams left out of the party (add in Army and Navy to make it 8) become the Big East football conference. Three of those schools play basketball in another conference already (Temple in the A-10, Army and Navy in the Patriot). That leaves 5 leftover schools to form a 12-school basketball conference with the 7 basketball-only members still in the Big East. This would make a more competitive football conference for these schools used to the high competition, and would also give heavy basketball competition for those striving for that. I think it is making the best of the bad options. Here is how it would break down. So there is just one scenario. There are many different way it could play out. It will most likely look nothing like this (Who saw Maryland and Rutgers going to the Big Ten?) and probably take a long time to finally settle. Another scenario I did not explore at all is one where the future Super-Conferences kick out weaker schools to make room for ones transferring in (for example, the Pac-12 kicking out Washington St. to make room for BYU). That potential move makes this even more unpredictable. I am really excited to witness this fluid time in college athletics where everyone is finding their new home and most likely working their way to this crazy Super-Conference format.